Sharing their passion for apples with consumers and young people is central to marketing and outreach activities at Great Lakes Farms. 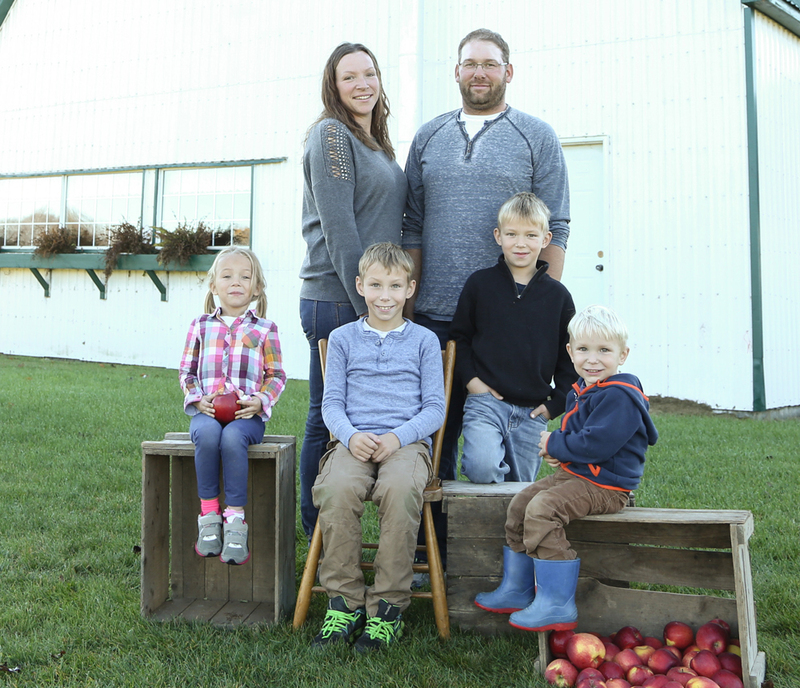 Since 2008, MaryAnne and Joe Van De Gevel have been growing apples on their Port Stanley-area farm where they’re raising their four young children, down the road from the Brooymans home farm where MaryAnne’s dad and brother grow apples too. About 90 per cent of the crop from their 40 acre orchard is sold into supermarkets through apple marketers like Martin’s and Algoma, with the remaining 10 per cent forming the core of their on-farm pick your own retail business. “Most of our orchard is planted in Gala apples, but for our pick your own business we have 15 different varieties so that we have apples ripe for picking throughout the whole harvest season,” explains MaryAnne, who also works as a supply teacher during the off season. Their customers’ pick your own experience is complemented by a corn maze, homemade apple baked goods in their on-farm store, and tractor rides through the orchard. And it is those tractor rides that provide the best opportunity for a little Apple 101 alongside the fruit picking. “The tractor rides are a great chance for us to talk to people about apple growing, about new technology, and the advancements in production,” she says. The Van De Gevels apply that same principle to the 30 to 40 school and youth groups that visit their farm every year, mostly in the fall. Although the majority are of Kindergarten age, a few high school hospitality and special needs classes and even adult groups also come on tours of the farm. A visit includes a tour of the orchard and a video that shows footage of all the steps of growing apples throughout the seasons. Orchard technology such as high density plantings, irrigation, and even the use of helicopters to protect trees against the threat of spring frost are part of the talk as well. “Not only is it fun to have the kids out, but it’s also a great way to reach out to future consumers and give them an understanding of where apples come from and what kind of work goes into producing food,” says MaryAnne. That passion for education and apples has also encouraged Great Lakes Farms to participate in student nutrition and school fundraising programs in their area. For example, they offer 10 pound bags of apples and applicious muffins to Elgin County schools to help them raise funds for the local Eat to Learn school nutrition program. It’s this school fundraiser that helped inspire development of the Fresh from the Farm program, a similar school fundraising program using both fruits and vegetables offered by Dietitians of Canada to many different school boards in the province. You can check out Great Lakes Farms at www.greatlakesfarms.ca, on Facebook at https://www.facebook.com/pages/Great-Lakes-Farms/109023025784527 or on Twitter at @GreatLakesFarms. Find this interesting? Then spread the word! 2019 © Ontario Apple Growers. All rights reserved.